Navigate to the Spacewar! page and follow the instructions on the readme. 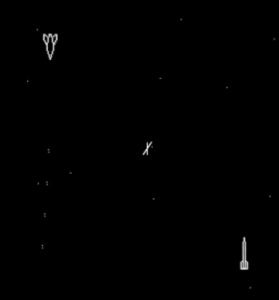 I was not born yet when Spacewar! was making the rounds in the early 1960s and was too young to remember Computer Space. However, I do recall playing Space Wars in early arcades in the late 1970s with my dad. Space Wars was produced by a company called Cinematronics and was inspired by Spacewar!. It is really awesome to have this emulated. Here is a nice piece on Bushnell and Computer Space in Continuum magazine from the University of Utah. Some of the history is explored in this article.